was notified by the National Weather Service that Lapeer County was under a tornado warning. Screenshot of the tornado taken from the iPhone app RadarScope. approximately 500 feet behind a damaged barn. The home owners sought shelter within their basement. Damage pattern is consistent with rotational force winds. Numerous individuals observed the tornado. The home owners and numerous horses within a barn were not injured. There was a void to the southeast for approximately 2 miles before another area of significant damage. damage pattern in this region is consistent with rotational force winds. damage pattern to the residence is consistent with rotational force winds. notified the National Weather Service who is expected to survey the damage on Friday 03-16-2012. 135 MPH). The tornado was on the ground for 9 minutes and traveled four to five miles. The EF2 Tornado in Oregon Township on March 15th of 2012 is the first confirmed tornado in Lapeer County during the month of March. It is the third strongest tornado in our county. 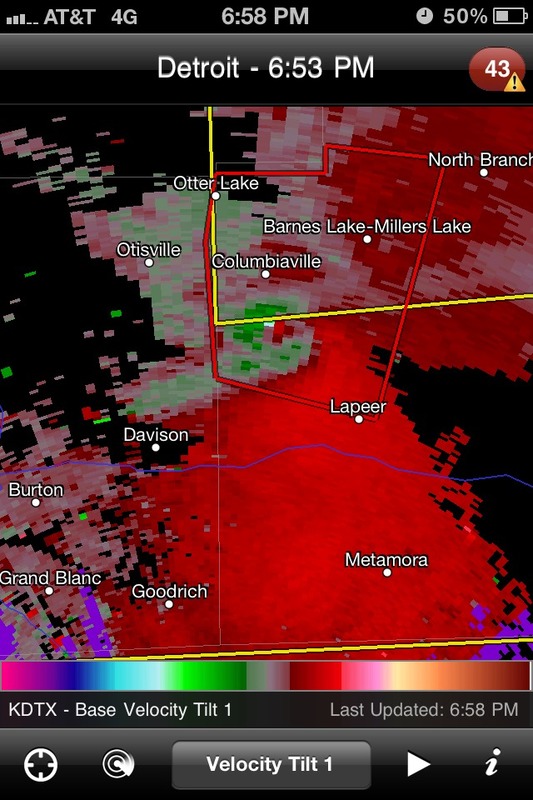 Both these tornado were near Columbiaville and part of the Flint- Beecher Tornado. Every other recorded tornado was either an EF0 or EF1 until yesterday.